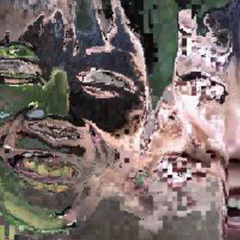 PixelPluck is a small application which distorts a movie using a "time displacement" algorithm. Each frame of the output movie is a composite of several frames of the input movie. 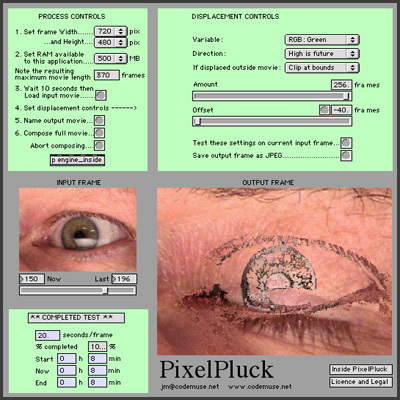 A more detailed explanation can be found in the application (click on "Inside PixelPluck" in the application) but the best way to understand it is to try it. PixelPluck is written (drawn?) in Jitter, a set of video, matrix, and 3D graphics objects for the Max graphical programming environment. Below are some examples of movies and pictures produced with PixelPluck. If you own Max4/Jitter, feel free to download the patch. 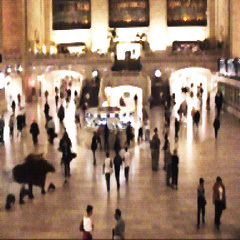 Ghostlike figures criss cross the foyer of New York's Grand Central Station. 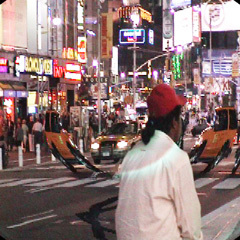 This short quicktime movie was produced with PixelPluck using each pixel's horizontal position as the "time displacement". Melting Yellow Cabs. The picture on the left shows how PixelPluck distorts objects in motion while leaving stationary objects unchanged. Here each pixel's distance to the center of the frame determines the "time displacement". Mask and Glass. These pictures were extracted from movies produced with PixelPluck. One uses the pixel's green value and the other the pixel's luminance as the "time displacement" variables.